Bulk pricing on orders of 5 or more! It is the premise of systems thinking that it is possible to evolve our thinking, learning, and communicating capacities. Of the skills cited by well known educational psychologist Benjamin Bloom, synthesis and evaluation are the two highest order skills. Systems thinking and its underlying framework, system dynamics, are particularly effective in developing these two thinking skills. 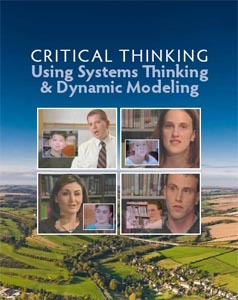 This book correlates critical thinking skills with the use of systems thinking and dynamic modeling. After creating a definition of critical thinking, it expands upon how to use the tools of systems thinking and dynamic modeling to improve this important trait in students. The why and the how of using systems thinking and dynamic modeling in education are the fundamental topics covered in this introductory text. based on the accompanying booklet for the video???? ?that School in Tucson, a longitudinal study of systems thinking in K-12 education, and is a direct correlation of Richmond?? ?s critical thinking skills with the tools of systems thinking and system dynamics used in K-12 education.